janiqueel.com finds the latest SRT production a bit frightening, but thoroughly enjoyable. 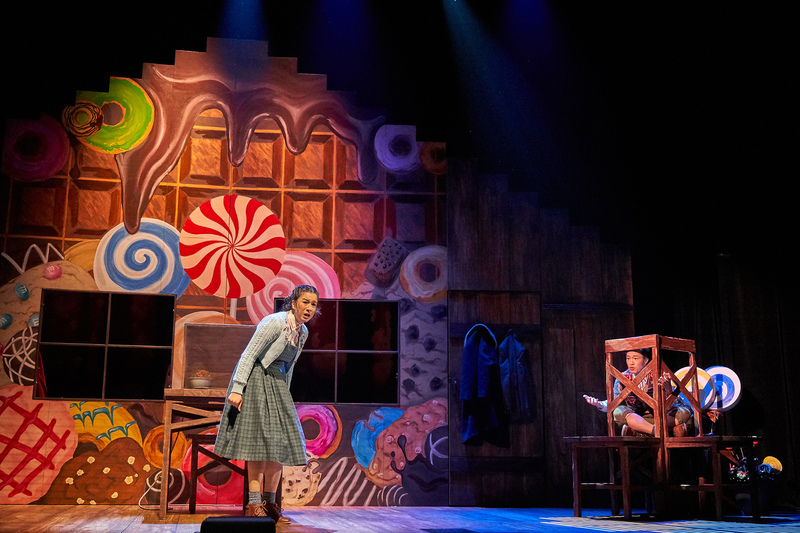 If you know the story of Hansel and Gretel and their struggles in a deep, dark forest inhabited by an elderly woman with a taste for small children, you must see SRT’s The Little Company funny, magical, quirky production of the Brothers Grimm classic tale. If you have children or can borrow a couple, bring them along. Hunger, fear, cannibalism, sibling rivalry, what’s not to like for the younger set? Did I say “…the story of Hansel and Gretel…” pardon me. For SRT in 2019 the play is GRETEL AND HANSEL, thank you very much. That trope is central to the exposition scenes at the beginning of the 50-minute drama. Gretel is the older sister not quite ready to welcome new family addition, Hansel, with open arms. They’ve grown into children by the time the play’s action begins, but sibling tension had not dissolved. The production I saw on a Saturday morning was full of kids most of who animated by the characters and their familial struggles. Tia Andrea Guttensohn (Gretel) and Joshua Lim (Hansel) do it all. They are the ensemble. Their parents are represented by coats and hats (a cloche for her; a fedora for him) on hangers which the actors grab, put their arms in the arms of the coats and become the mother and father down on their luck and hardly able to support the family. By modern standards, this pair might be called dysfunctional as they decide to let the kids roam the aforementioned deep dark woods in search of food. Guttensohn and Lim are perfectly cast. She’s a head taller. His winsome features are perfectly younger brother-ish. 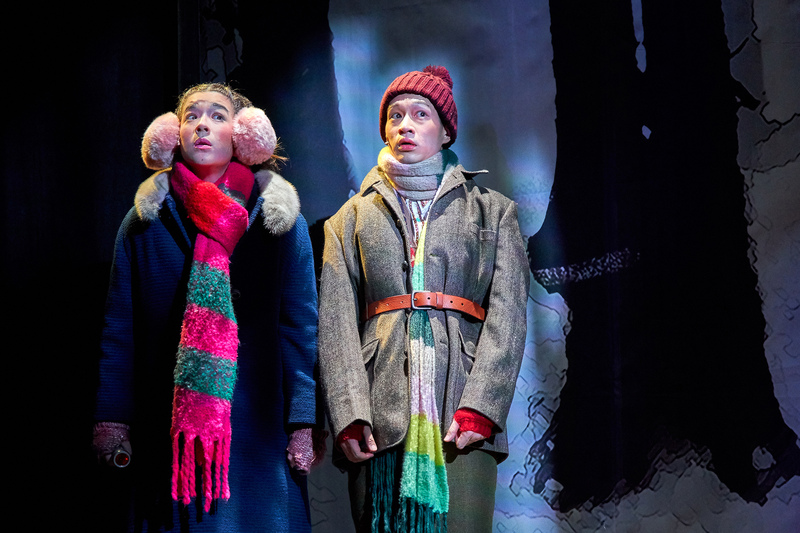 They race around the stage set which transforms from the cozy family cottage to the scary hovel of the old woman who welcomes the children with an ulterior motive clear to the audience but not at first to Hansel and Gretel. Gretel and Hansel – sorry! I thought of taking Mr. C. (Official Child of janiqueel.com) but, at two years he would have been restless and a tad frightened by the flashing lights and the ominous shadows. I saw some three- and four-year-olds, though as well as older kids and they loved it. Especially when the characters roamed the audience with torches looking for each other. “SHE’S/HE’S OVER THERE!” The audience members shouted. To say the kids were into the drama would be, to say the least. They were part of the action. Fifty minutes was the right length, too. Long enough to tell a gripping tale, but not too long for the younger set eager for an after-performance lunch on Robertson Quay. No one is eaten during the production. Bring the kids, or go alone. It is a treat. With writing and research help from JKJ.